EA20SNB, Acoustic-electric Folk/Western guitar from Washburn in the Nuno Bettencourt series. 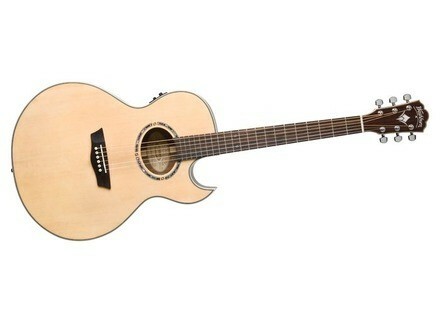 Washburn Guitars and Nuno Bettencourt, introduce the EA20SNB Signature stage ready acoustic/electric guitar. The Washburn EA20SNB Nuno Bettencourt Signature is a thin jumbo style acoustic/electric with a Florentine cutaway for extended upper fret access. It features a solid Alaskan Sitka spruce top with quarter sawn scalloped bracing and rosewood back and sides, a satin finished mahogany neck topped with a rosewood fingerboard which matches the rosewood bridge. The fretboard also features custom mourning widow inlays at the 12th fret. Chrome Grover 18:1 tuners were chosen on this model and a unique rosette features the mourning widow motif which ties in with the fretboard inlay. The EA20SNB is equipped with a Fishman Isys+ Tuner/Preamp/Pickup combo. The EA20SNB carries a Suggested Retail Price of $890.90 and comes with a Limited Lifetime Warranty. Visit www.washburn.com for more information.